My first post about the problems of growing things like cucumbers and tomatoes at False Bluff was in the December 11, 2012 post; and it took us less than a year to learn that the approach I wrote about then does not work. 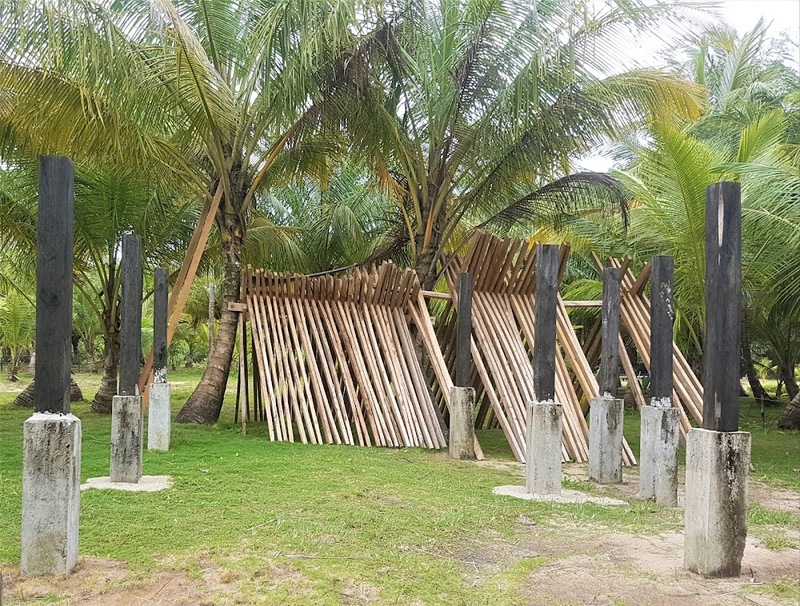 The heat, the intense sun, the salt spray, the sometimes-heavy winds, and the sometimes-heavy rains aged the protective structure into uselessness. Sure, I could have a longer-lasting wood cut for poles and set them in concrete, or paint everything, or buy and install real thatching for the roof of the shade house. Or I could have a living, productive defense against the worst of the weather: banana trees. Banana trees aren't entirely immune to the problems of things that grow near the sea, but so far the worst damage I see to the banana trees we have already have growing close to the sea is some scalding that puts brown patches on the leaves. I haven't noticed any decrease in fruit production. So, the first line of defense will actually be two lines of defense: one straight line of banana trees; and about fifteen feet away from these (and to the south) a second straight line of banana trees. Each tree in the second line will be planted in the spaces between the trees in the first line. Together, the two staggered lines will present sort of a wall between the Caribbean and vegetable plants. Bananas grow and clump up pretty quickly, but it'll be at least a year before we'll start a vegetable garden. In the meantime we'll probably add a few more rows of banana trees so that we can plant vegetables between rows. That way when the trees are grown they'll provide some shade from the worst of the overhead sun. From a clump of banana trees choose a tree. Prop up any tree that decides to come along. Voila! The first row of defense in place.